In 1935, a little boy in North Carolina was introduced to metalworking by a WPA project. He apprenticed in his uncle’s metal shop and eventually discovered a passion for jewelry making. In 1941 at age 16, he moved to New York City and got a job in the Diamond District. When he was 23, he opened his own studio in a small walk-up with three employees. And at 25, he achieved his first triumph as a jeweler: the cover of Vogue magazine. Thus, from rags to riches, David Webb entered the fashion firmament. He soon became a darling of the New York social set and The New Yorker called him “the new meteor around town.” Fashionable women flocked to his new salon on 57th Street, where everything was produced in his on-site workshop. Webb’s designs were optimistic, bold, and not afraid to take risks—in other words, all-American. His inspirations, though, were global; motifs from Egypt, Rome, India and China figured large in his work, as did Aztec and Mayan themes. 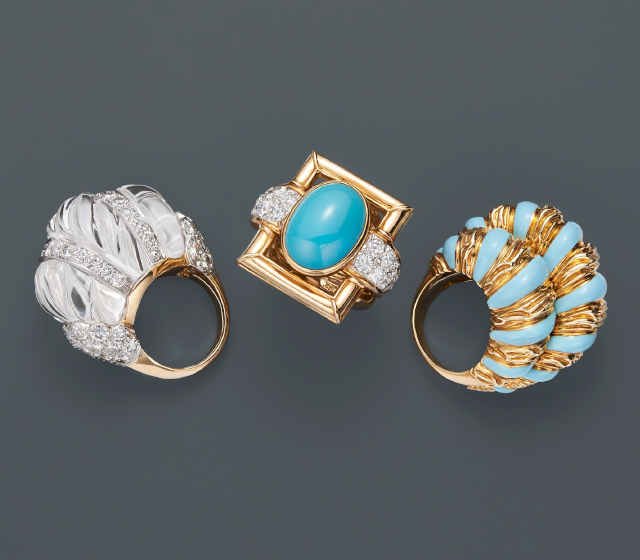 Although Nan Kempner, Diana Vreeland, Jackie Kennedy, Elizabeth Taylor, Brooke Astor, Evelyn Lauder and Gloria Vanderbilt adored his jewels, David Webb led a private life and was rarely photographed. He died in 1975 at a young age, but his namesake company lives on.